We’d love your help. Let us know what’s wrong with this preview of Only the Paranoid Survive by Andrew S. Grove. To ask other readers questions about Only the Paranoid Survive, please sign up. What other could complement "Only the Paranoid Survive" for someone who found that book revelatory? 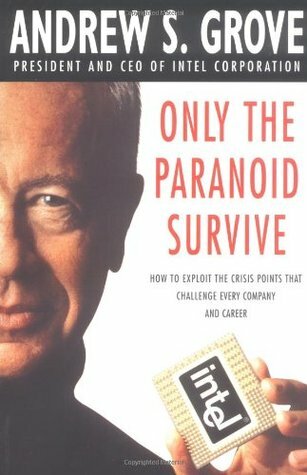 Why is the title of Andy Grove's book "Only the Paranoid Survive"? Does this mean that Autor has a Paranoia like thinking? or he has to think like having a Paranoia Disorder? I picked this book because it was referred by Ben Horowitz (http://bhorowitz.com/2011/04/15/peace...). Other reason being the book's interesting title which somehow conveyed to me that it must be a book about how Andy Grove was paranoid (in good sense) enough to make Intel an Awesome company. But as soon as started the book I become disappointed because it's not the book I thought it to be. Its not about Andy Grove being tough CEO or his paranoid decisions. It's is just like any other common busi I picked this book because it was referred by Ben Horowitz (http://bhorowitz.com/2011/04/15/peace...). Other reason being the book's interesting title which somehow conveyed to me that it must be a book about how Andy Grove was paranoid (in good sense) enough to make Intel an Awesome company. But as soon as started the book I become disappointed because it's not the book I thought it to be. Its not about Andy Grove being tough CEO or his paranoid decisions. It's is just like any other common business book written by a High profile CEO. Book is all about "Strategic Inflection Point" that in simple language means any BIG turn of events in your company (or your industry or technology) like Intel ditched Memory business - the business it started with - and moved to microprocessors business. Book doesn't give any practical tips or secret sauce to handle these big turn of events. Nothing at all. It's more like slog it through, brainstorm with your team, decisions can be tough, you need to take your team with you etc etc. But you would have read all those in 100s of blogs previously. 1. CxOs (or senior management team) are always 'last to know' guys. They get bad news very, very late. This is so true, I totally agree to this. Your middle management will filter the info/news before presenting it to you, and nearly all the times they will present data/story in a format so that they look smart, tough, intelligent and proactive. No one wants to tell the bad news. Create a culture in your team/company so that people are open to you (or their supervisors) without any inhibition of being reprimanded/joked/ignored or given a look like it's above your pay grade dude. Create an open and transparent culture. Be open to healthy arguments, in fact encourage healthy arguments. This culture can't be created in days or months, it will take years but it'll be worth it. 2. People (even competent, highly intelligent, serious-minded people) can come to different set of conclusions about a given set of facts. For ex: IBM and Intel went two different ways on using X-Ray to define feature of a chip. So nothing is Right or Wrong. Iterate and Iterate as fast as you can. Fast iteration is better than slower qualitative iteration. The strategies and decisions, and luck, Intel embraced are remarkable and to cover them all in detail in a short book would have been impossible. The fundamental essence of this book is that the only constant we can expect in business is CHANGE. How do we anticipate it? How do we prepare for that point where we either change or die? The ones we sometimes see coming and the ones we don’t. That Inflection Point. Can we recognise or anticipate change or do we create processes that enable us to rapidly respond once the change is obvious? For well-established market leaders that fail, this is typically why. History is littered with huge multi-national companies that failed to see the change and respond effectively - they don't exist anymore. Intel was nearly one of those companies but this book provides very interesting insight and the remarkable thinking that existed within Intel at the time to deal with the pivot necessary to save their business. The book is written with the flow of a story, which helps it resonate well. It also reminds us that many decisions involve agonising analysis and reasoning, and are extremely personal. The book is full of Grove’s war stories which are really interesting and relevant as we lived through many of these events. A good point that I remember from the book is when Andrew Grove recollects his darkest moment 'when he realised that not only were the Japanese cheaper in manufacturing memory chips, but their quality levels were at levels that Intel didn’t even think possible'. Intel’s move away from memory to microprocessors was traumatic and the inflection “point” was not so much a point as a long drawn out and painful affair. The backdrop to that inflection point and other points, make this book a great learning experience. Today Andy Grove died at the age of 79. His book "Only the Paranoid Survive" talks about his key business philosophy. One should always be on the lookout for new trends or products that might displace or destroy yours. Under him, Intel was famous for cannibilizing their older chips, their cash cows, with the new ones. The competition just couldn't follow their relentless pace. I recommend the book to everyone in management or business whether in high-tech or not. "The replacement of corporate heads is far more motivated by the need to bring in someone who is not invested in the past than to get somebody who is a better leader or better manager in other ways." "Put all of your eggs in one basket, then WATCH THAT BASKET"
If so, go to it. If not, resist it. [Great leadership during change starts by letting chaos reign (debate), then, when the time is right, reign in the chaos (determined march)] This dynamic dialectic is a must. The best part of Andy Grove's book might be the title: "Only the Paranoid Survive". Large organizations often fail, because they don't adapt fast enough. There are two types of forces that organizations run into. 1x forces, which fall within the normal action/reaction that people and organizations are easily able to adjust to. However, there are also 10x forces that fundamentally change the rules, and most people and most organizations fail to adapt to these more fundamental changes quickly enough. For example, think of these changes as waves in the ocean. The wave may come from any direction, but all are manageable. However, occasionally there is a tidal wave --- which you can detect and respond properly to, but that response is fundamentally different than the way you respond to a normal 1x wave. In Intel's case, they faced 10x forces twice. 1. Intel started in the RAM business. Japanese factories caught up with them. The Japanese had lower cost structures and higher volumes, and government support - they sucked all of the profit out of the RAM business and ultimately took Intel's market share. Intel managed the transition by moving from a RAM company to a CPU company. 2. Customers boycotting Intel CPUs. Intel never thought of end-customers as their customers, because they didn't sell direct to the end customers. However, they started branding their CPUs and asked manufacturers to put an "Intel Inside" logo on computers that used Intel CPUs. When they ran into small manufacturing problems and didn't take massive steps to correct those problems, their end consumers felt that Intel was taking advantage of them, and therefore started boycotting their chips. Intel took massive losses, but eventually recognized they needed to service both end-consumers and their normal manufacturer customers. 3: Customers: Changing taste in Ford/GM cars. Attitude shifts. Super-computers. 4: Suppliers: Airlines vs Travel Agents. "Second Sourcing" in the tech component business. Andy Grove, then CEO of Intel Corp, is clearly worth listening to on the subject of management. The "Wintel" success story is well known. More harrowing was Intel's earlier self-transformation from making memory chips to making microprocessors. 1) Figure out if a major change is imminent. If so, you're about to enter what Grove calls "the valley of death". 2) Figure out how to deal with it. Largely (for CEOs), this invo Andy Grove, then CEO of Intel Corp, is clearly worth listening to on the subject of management. The "Wintel" success story is well known. More harrowing was Intel's earlier self-transformation from making memory chips to making microprocessors. 2) Figure out how to deal with it. Largely (for CEOs), this involves listening to your employees & doing your homework. 3) Set a new course, sell it to your company, and stick to it. The "secret" to success here is identifying the oncoming crisis early & reacting sensibly. He relates the story of Apple, a company with clearly superior products - the Mac operating system, the first good laser printer - completely missing the shift from proprietary to open PC standards, and ending up as a niche player. John Sculley, then Apple's CEO, acknowledged this crucial mistake years later. Groves thinks Sculley knew this shift was happening , but wasn't able to overcome Apple's "inertia of success". Curiously, this was pretty much the same problem IBM had when PCs began displacing mainframes. It's very hard for an organization to give up a strategy that has been richly rewarded in the past. In management, as in engineering, we often learn more from failures than successes. Grove's case histories will make informative reading for anyone in business. Not many of us are CEOs, but we'll all go thru Grove's "strategic inflection points" in our careers. خیلی وقت بود می خواستم این کتاب رو بخونم ولی فرصت اش پیش نمی یومد، ولی حالا که خوندنش رو تموم کردم با خودم می گم ای کاش زودتر می خوندم این کتاب رو که نوشته اندرو گرو مدیرعامل و رئیس هیئت مدیره پیشین اینتل هست، پیتر دراکر هم درباره این کتاب گفته: «این اثر برجسته کتابی خطرناک می باشد که انسان را ناچار به اندیشیدن می نماید!»، از موضوعات محوری و مهم این کتاب نقطه های چرخش راهبردی هست، که به نظر باید همه در این زمینه یاد بگیریم چون بدون شک در زندگی باهاش بارها مواجه خواهیم شد، در مورد تصمیم گیری در ز خیلی وقت بود می خواستم این کتاب رو بخونم ولی فرصت اش پیش نمی یومد، ولی حالا که خوندنش رو تموم کردم با خودم می گم ای کاش زودتر می خوندم این کتاب رو که نوشته اندرو گرو مدیرعامل و رئیس هیئت مدیره پیشین اینتل هست، پیتر دراکر هم درباره این کتاب گفته: «این اثر برجسته کتابی خطرناک می باشد که انسان را ناچار به اندیشیدن می نماید!»، از موضوعات محوری و مهم این کتاب نقطه های چرخش راهبردی هست، که به نظر باید همه در این زمینه یاد بگیریم چون بدون شک در زندگی باهاش بارها مواجه خواهیم شد، در مورد تصمیم گیری در زمانی که درگیر نیروی دگرگون ساز ۱۰ برابر شده ایم، یا بهتر چطوری این نیروها را پیش بینی کنیم و خودمون رو براشون آماده کنیم، چطوری سازمان را به سمت درست هدایت کنیم و چطوری تصمیمات به موقع و درستی بگیریم، به نظرم خوندن این کتاب خوب رو از دست ندید. This book discusses some really important ideas, primarily the "10x forces" that fundamentally change businesses and the "strategic inflection points" during which an industry is transformed by these "10x forces" (yes, he quotes that term everywhere it appears in the book). Grove explores these ideas using his experience as CEO during Intel's switch from making memories to making microprocessors in the late 80's as the primary example, but he emphasizes that these ideas are not unique to the tec This book discusses some really important ideas, primarily the "10x forces" that fundamentally change businesses and the "strategic inflection points" during which an industry is transformed by these "10x forces" (yes, he quotes that term everywhere it appears in the book). Grove explores these ideas using his experience as CEO during Intel's switch from making memories to making microprocessors in the late 80's as the primary example, but he emphasizes that these ideas are not unique to the tech industry and also explores SIPs in other industries ranging from sound in the movie industry to Wal-Mart in retail. After explaining these concepts and pointing to that range of examples, the author spends most of the book discussing how to manage companies during these crises: how to know that you're in the middle of a SIP, how to separate signal from noise during that confusing period, and the importance of fostering healthy debate but subsequently projecting decisive leadership. The material covered in this book is important for anyone in business, and I mostly agreed with the author's high-level ideas but I was disappointed by the book itself. The case study of Intel was fascinating, especially hearing it told from the man in charge at the time. But much of the advice was either obvious or overly simplistic. For an obvious example, take the idea of listening to what your sales people and individual contributors on the ground are telling you about how their jobs are changing. This seems like something managers should *always* be doing. It could be one of those things that sounds obvious when you say it but isn't something you think about when you're in that position. Or maybe I'm unusually aware of these ideas because the book is 15 years old now or because I've been lucky to work for engineering-driven companies that were well aware of these ideas (and socialized them). Quite likely the approach just didn't resonate with me because the book is targeted at middle and senior managers, not individual contributors. The "Reign in Chaos" chapter that describes setting strong direction after a period of open debate had some particularly condescending passages. On page 145 Grove counsels managers that "admitting that you need to learn something new is always difficult. It is even harder if you are a senior manager who is accustomed to the automatic deference which people accord you owning to your position. But if you don't fight it, that very deference may become a wall that isolates you from learning new things. It all takes self-discipline." That's right, it's tough as a senior manager to avoid completely ignoring the ideas of your subordinates, but you can do it with a little bit of self-discipline. Next time one of your reports has something to say and you just want to send them back to the salt mine, consider listening instead. On page 163 there's the story of a "very competent" senior manager at Intel who had some great ideas but according to Grove just went about them poorly. He "organized a committee...to investigate an issue and come up with a recommendation. It turned out that this manager knew all along what he wanted to do, but instead of giving that direction to the committee, which he could have, he was hoping to engineer a bottom-up decision to the same effect. When the committee came up with the opposite recommendation, he felt cornered. At this late stage, he tried to dictate his solution to people who by now had spent months struggling with an issue and had firmed up their minds. It just couldn't be done. Coming as it did at this late stage, his dictate seemed utterly arbitrary." Yes, telling a committee of your reports that the results of their lengthy discussions are all wrong and you're going to do the opposite because you think it's better just _seems_ arbitrary. And I guess the lesson to managers is: don't ask your reports to think about what to do because they'll just come up with the wrong answer and be angry when you set them straight. I had heard so much about this book being a classic, and I finally read it. When industries/ structures/ networks change - it can ruin organisations or catapult them to dominant positions. It is also a signal to either scale up in that direction or retreat completely out of the current one. It's also a bril I had heard so much about this book being a classic, and I finally read it. It's also a brilliant reason why value investors hate businesses that are prone to significant changes - because then, one has to rely on management prowess to be able to change, and that tends to be unpredictable. "One, don’t differentiate without a difference. Don’t introduce improvements whose only purpose is to give you an advantage over your competitor without giving your customer a substantial advantage. Two, in this hypercompetitive horizontal world, opportunity knocks when a technology break or other fundamental change comes your way. Grab it. The first mover and only the first mover, the company that acts while the others dither, has a true opportunity to gain time over its competitors—and time advantage, in this business, is the surest way to gain market share. Three, price for what the market will bear, price for volume, then work like the devil on your costs so that you can make money at that price. This will lead you to achieve economies of scale in which the large investments that are necessary can be effective and productive and will make sense because, by being a large-volume supplier, you can spread and recoup those costs. By contrast, cost-based pricing will often lead you into a niche position, which in a mass-production-based industry is not very lucrative." "Senior managers got to where they are by having been good at what they do. And over time they have learned to lead with their strengths. So it’s not surprising that they will keep implementing the same strategic and tactical moves that worked for them during the course of their careers—especially during their “championship season.” I call this phenomenon the inertia of success. It is extremely dangerous and it can reinforce denial." "Admitting that you need to learn something new is always difficult. It is even harder if you are a senior manager who is accustomed to the automatic deference which people accord you owing to your position. But if you don’t fight it, that very deference may become a wall that isolates you from learning new things. It all takes self-discipline." "I was stunned when I heard this. Listening to Sculley gave me the impression that he understood the implications of the horizontal industry structure. It appeared that he just wasn’t strong enough to overpower Apple’s inertia of success that existed because of its fifteen-year history as a fully vertical computer company." This review has been hidden because it contains spoilers. To view it, click here. Good book. This book was written in 1996, and like anything has started to show its age. The basic messages/ themes still ring true. Although it is funny to read about Apple and Steve Jobs and how they were basically regarded as being left for dead. Now of course, Jobs came back strong and have higher market capitalization than Microsoft. So, I guess the lesson is that this book is good, but you have to still take it with a grain of salt and put it in perspective. My favorite part was when he Good book. This book was written in 1996, and like anything has started to show its age. The basic messages/ themes still ring true. Although it is funny to read about Apple and Steve Jobs and how they were basically regarded as being left for dead. Now of course, Jobs came back strong and have higher market capitalization than Microsoft. So, I guess the lesson is that this book is good, but you have to still take it with a grain of salt and put it in perspective. My favorite part was when he was talking to another CEO type about the direction of Intel and about getting out of the memory biz an into microprocessors. The idea of walking out of the building and coming back in like you were a brand new manager/ ceo. I think that was the real gem of the book. Highlighting that the best CEO is extremely flexible and creative with the way he/ she thinks. Never be held back by the past, either with situations or your previous thinking. I also really liked the idea of basing decisions of facts and data. At the same time he stresses the importance of data lag and having to make decisions before all the data has been compiled because the world changes so fast and you only get one chance to become the first mover. I understand why CEOs around Silicon Valley look to Andy Grove's books for inspiration. Written in 1996 (20 years ago!) his thesis still feels very relevant and I learned a great deal from his examples from running Intel that are helping me to be a more productive & thoughtful employee in small scrappy startups. I read High Output Management before, and had a harder time relating his examples to my work in small unstructured startups - but I was able to glide through this quickly. The big key I understand why CEOs around Silicon Valley look to Andy Grove's books for inspiration. Written in 1996 (20 years ago!) his thesis still feels very relevant and I learned a great deal from his examples from running Intel that are helping me to be a more productive & thoughtful employee in small scrappy startups. I read High Output Management before, and had a harder time relating his examples to my work in small unstructured startups - but I was able to glide through this quickly. When change comes to an industry, often the most established company (and the upper management who are most isolated & have the most invested in the way things are) are the slowest to adapt and move forward with the new reality. You have to always listen to the Cassandras of your organization (on the ground people usually) and catch hints of discomfort & change. Allow some creative chaos while you're figuring out the new direction, but then as a manager, you then need to rein it in to direct everyone forward. You will generally regret not making the uncomfortable/scary decision to change earlier. You'll probably make it too late, or if you're lucky, just in time. مطلب جدیدی در این کتاب پیدا نمیکنید که در سار کتاب های مدیریت و خصوصا مدیریت تغییر نخوانده باشید. بعلاوه کتاب بسیار قدیمی شده است. البته نیروی ششم پورتر که نویسنده به آن اشاره می کند جالب است. Heard about this book very long ago. I believe like it says - only the paranoid survive. And what's related to business, I'm probably paranoid. Wasn't, but learned. "Possibility that what your business does can be done in a different way." is great thing. If you can't stop over-competitiveness created by over-population, then what you can do, adapt, find new ways. It's interesting to read about technology 20+ years ago: "What is internet anyway?" What is microprocessor anyway? Race with time withou Heard about this book very long ago. I believe like it says - only the paranoid survive. And what's related to business, I'm probably paranoid. Wasn't, but learned. Эта книга от одного из отцов легендарной компании Intel будет очень полезна особенно предпринимателям в вопросах предупреждения кризиса их бизнеса. Зачастую кризис похож на водоворот, но о нём как правило стаёт известно, когда с него уже невозможно выбраться. Автор подскажет как вовремя определять такие водовороты, как уберечься от пагубного воздействия, или же бездействия личного человеческого фактора, когда принятие управленческих и стратегических решений нужны было реализовать ещё "вчера". И е Эта книга от одного из отцов легендарной компании Intel будет очень полезна особенно предпринимателям в вопросах предупреждения кризиса их бизнеса. A absolute must read for every serious entrepreneur. I wish to become as good leader and entrepreneur as he was. This book does not only touch a very interesting topic that mean life or death for enterprises, but adding the fact that the book was written in the nineties - it's very interesting to see a world class CEOs view on the potential changes Internet will bring - from our perspective in the year 2016. It is the best one book to decipher the history of Intel. This is the autobiography of founder. This book's theme is twofold. One is the innovation of micro Professor. And one is a strategy to sell it. This book focuses on the latter. This is a great book to decipher the strategy. Of course Moore's Law in the semiconductor has also been described. Andy is a shrewd leader who took Intel company from a fail to become a success story all over the world. besides chronological events he shows how a company sooner or later will suffer in a turmoil and only the paranoid and surfing against the waves, inflection points, would help out. This book is a strategy-focused and would benefit any person with needed leadership skills. Shortly speaking i liked it a lot. It's not as great as Grove's previous work - high output management. Surprisingly readable book about what it's like to be at a company at the moment when it has to either change the way it operates or go into a decline. That said, I wish I were not the kind of person who now reads business books for fun. Inflection points create threats and opportunities - Intel’s CEO explains how the company survived the memory upheaval, and explains some important practical lessons along the way. Book about disruption, and how companies should be prepared for Strategic inflection points, and drastically adapt while navigating uncertainty. The interesting example used throughout the book is from Intel, where they changed their business core from DRAM to microprocessors after increased competition from Japanese semiconductor manufacturers who, by 1983, crushed Intel in their previously dominant position in the memory market. “10X” Force: When a change in how some element of one’s b Book about disruption, and how companies should be prepared for Strategic inflection points, and drastically adapt while navigating uncertainty. “10X” Force: When a change in how some element of one’s business is conducted becomes an order of magnitude larger than what that business is accustomed to, then all bets are off. In the face of such “10X” forces, you can lose control of your destiny. Eventually, a new equilibrium in the industry will be reached. What such a transition does to a business is profound, and how the business manages this transition determines its future. I like to describe this phenomenon as an inflection point. a strategic inflection point is when the balance of forces shifts from the old structure, from the old ways of doing business and the old ways of competing, to the new. Before the strategic inflection point, the industry simply was more like the old. After it, it is more like the new. When a Wal-Mart moves into a small town, the environment changes for every retailer in that town. A “10X” factor has arrived. When the technology for sound in movies became popular, every silent actor and actress personally experienced the “10X” factor of technological change. When container shipping revolutionized sea transportation, a “10X” factor reordered the major ports around the world. Alternatively, so might redefining your business to provide an environment, rather than a product, that people value, like the example of an independent bookstore that became a coffeehouse with books to compete with the chain bookstores that brought Wal-Mart-style competitive advantages to their business. Demoralized organizations are unlikely to be able to deal with multiple objectives in their actions. One, don’t differentiate without a difference. Don’t introduce improvements whose only purpose is to give you an advantage over your competitor without giving your customer a substantial advantage. Three, price for what the market will bear, price for volume, then work like the devil on your costs so that you can make money at that price. This will lead you to achieve economies of scale in which the large investments that are necessary can be effective and productive and will make sense because, by being a large-volume supplier, you can spread and recoup those costs. A few industry figures have been going around touting the emergence of inexpensive “Internet appliances.” These simplified computers would rely on other larger centralized computers someplace on the Internet to store their data and to do much of their number crunching, and would just transmit to the computer users whatever software and data they needed, whenever they needed it. Your Career Is Your Business I have long held that each person, whether he is an employee or self-employed, is like an individual business. Your career is literally your business, and you are its CEO. Just like the CEO of a large corporation, you must respond to market forces, head off competitors, take advantage of complementors and be alert to the possibility that what you are doing can be done in a different way. It is your responsibility to protect your career from harm and to position yourself to benefit from changes in the operating environment. Andy Grove was senior manager and CEO at Intel for a very long time and was one of the architects of the spectacular rise of Intel as microprocessor powerhouse. The book was written by Andy grove in 1997, one year before he stepped down as CEO of Intel. He outlines how he dealt with what he called “inflection points” at Intel. An inflection point is in his definition a point where business changes so profoundly that either the business changes as well or the company will be killed by competitors. Andy Grove was senior manager and CEO at Intel for a very long time and was one of the architects of the spectacular rise of Intel as microprocessor powerhouse. The book was written by Andy grove in 1997, one year before he stepped down as CEO of Intel. He outlines how he dealt with what he called “inflection points” at Intel. An inflection point is in his definition a point where business changes so profoundly that either the business changes as well or the company will be killed by competitors. For Intel, this was the case when in the 1980ties, the Japanese suddenly were able to produce better and cheaper memory chips which were until then Intel’s main business. Grove managed then to shut down the memory business and concentrate the efforts on the microprocessor business which was until then only a small part of the business. His first person (CEO) perspective is very interesting to read as change doesn’t come naturally to large and succesful companies. I also found the book especially interesting because Intel is one of the famous cases for a “size moat” in Bruce Greenwald’s “Competition demystified”. Greenwald there argues that Intel’s success in microprocessors was more or less given because they had such a size advantage compared to AMD, their major competitor. Reading the book, I got the impression that Prof. Greenwald greatly simplified this. There seemed to have been several junctions on the way where Intel easily could have went “of course”, such as the rise of the RISC processors or the question at that time if multimedia will be won by PCs or TV sets. For me, one of the lessons o f the book is that Moats, at least in technology are always “weak moats” as the development is just too dynamic. If I use this concept for instance for electrical cars, then as a traditional car manufacturer I should ask the question: What if electrical cars have 10 times better reach, 10 times more charging stations, charge 10 times quicker then now ?. Would I have a problem with this ? The answer would clearly be yes. Grove also observes that you only have a chance to survive such inflection points if you start early, so when the old stuff is still selling well. Once the company is in real trouble, then change is much much more difficult. The final chapter in the book deals with how Grove thought about the internet. One should remind that this book was written in 1997, but it is fascinating how Grove already identified industries which would be badly effected by the internet. He already was aware that for instance a lot of ad revenues would flow from print into the internet. One should not forget that this book was written a year before Google was even founded !!! Another interesting aspect was that at that time Apple was considered by Grove a failed company as they did not change their vertical business model to a “Horizontal” one. Clearly , mobile was not on his radar screen at that time. As a final observation: Without the great run up in the stock price this year, Intel’s stock would have been more or less flat against the time when Grove stepped down as CEO in 1998. So even a great company as intel might not be a great investment at any price…. I found this book very insightful with some classic business knowledge from the Arthur. The focus was on "Inflection Points" which some might consider where a bell curve can show downward/upward momentum for any particular instance. I took from this book a sense of always be willing to re-evaluate your personal standing within a company if you are an employee or business owner. It's very important to always pay attention to external forces that might effect your standard of living or the nature I found this book very insightful with some classic business knowledge from the Arthur. The focus was on "Inflection Points" which some might consider where a bell curve can show downward/upward momentum for any particular instance. I took from this book a sense of always be willing to re-evaluate your personal standing within a company if you are an employee or business owner. It's very important to always pay attention to external forces that might effect your standard of living or the nature in which your business will operate at some point. He mentions companies such as HP, Compaq, Apple, Microsoft, and of course Intel in regards to critical point where industries were changing/converging and how some of these companies did not react fast enough or refused to face the inevitable. Which eventually caused their demise or created a "fight or flight" type of situation to sustain competitiveness in their industry. A good book, but quite outdated - though he talks about how to identify 10X trends, or things that have the ability to drive your business into the ground or take you into the skies if you are able to follow the trend and lead it. The advice is sound but the framework developed to recognize the trends or how to act on it isn't as concrete. I wasn't impressed with the solutions offered. They are generic solutions, i.e. get middle management involved in the decision making process, take care of the A good book, but quite outdated - though he talks about how to identify 10X trends, or things that have the ability to drive your business into the ground or take you into the skies if you are able to follow the trend and lead it. The advice is sound but the framework developed to recognize the trends or how to act on it isn't as concrete. I wasn't impressed with the solutions offered. They are generic solutions, i.e. get middle management involved in the decision making process, take care of the inflection points, keep a look out and don't be in delusion, all of these are good advice, but not specific enough. The book can be summed up as. - Beware of dangerous trends and be quick on your feet. The books main focus is on big environmental changes that affects a business, which Grove terms "10x" points, as previous forces impacting a company increase significantly (negatively or positively). Its a short read, and a lot of it feels like the type of content you could read elsewhere, though Grove brings an interesting set of anecdotes being someone who led Intel through many of these "10x" events during the growth/expansion of computing in the 80's and 90's. One of the best things about rea The books main focus is on big environmental changes that affects a business, which Grove terms "10x" points, as previous forces impacting a company increase significantly (negatively or positively). Its a short read, and a lot of it feels like the type of content you could read elsewhere, though Grove brings an interesting set of anecdotes being someone who led Intel through many of these "10x" events during the growth/expansion of computing in the 80's and 90's. Andrew Stephen ("Andy") Grove (born 2 September 1936), is a Hungarian-born American businessman, engineer, and author. He is a science pioneer in the semiconductor industry. He escaped from Communist-controlled Hungary at the age of 20 and moved to the United States where he finished his education. He later became CEO of Intel Corporation and helped transform the company into the world's largest m Andrew Stephen ("Andy") Grove (born 2 September 1936), is a Hungarian-born American businessman, engineer, and author. He is a science pioneer in the semiconductor industry. He escaped from Communist-controlled Hungary at the age of 20 and moved to the United States where he finished his education. He later became CEO of Intel Corporation and helped transform the company into the world's largest manufacturer of semiconductors.